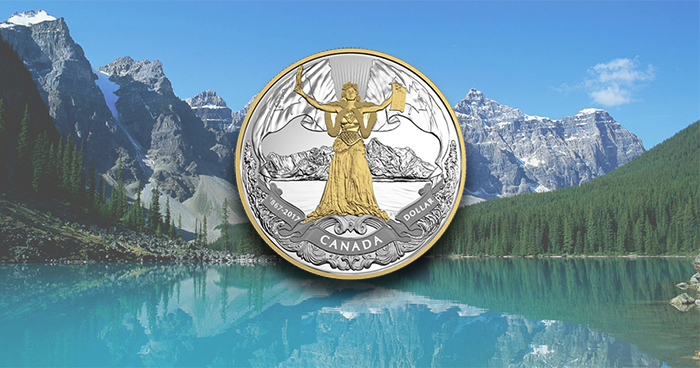 The Royal Canadian Mint has released a new silver $1 coin that celebrates a milestone anniversary in Canada’s history: the 150th anniversary of Canadian Confederation. The event, which established Canada as a sovereign nation, brought together the provinces, territories, and remaining colonies of British North America into a single dominion. The ultimate aim of confederation was the subject of the Charlottetown Conference in 1864, which started the trip to a new nation, proclaimed on the 1st July 1867. In this symbolic image of Canada—a classic allegory that represents a confident nation on its 150th anniversary—every intricately engraved element, enhanced by the careful use of multiple finishes, represents a different political, historic, geographic, and social aspect that speaks of Canadian history. Given the nation’s relative youth, the allegorical Canada is a picture of grace and a vision of strength in her protective armour—yet she carries no weapon, which is symbolic of Canada’s historic peacekeeping role and its efforts to bring peace throughout the world. In the foreground, Canada rises up strong, majestic, and bold as she bears a youthful appearance. Her brow is wreathed with a glorious garland of poppies, much as the lyrics to the national anthem O Canada affirm in the official French version (in the third line, “Glorious deeds circle your brow”). Facing outward as though looking to the future, Canada’s gaze is calm and steady while her arms are open wide, ready to embrace what challenges and triumphs lie ahead. In one hand is a representation of the British North America Act, which represents the birth of the Dominion of Canada 150 years ago. In the other hand is a single feather, which pays tribute to those who helped forge the nation’s path, including the First Nations peoples and the Fathers of Confederation. A fur cape is a further reminder of First Nations traditions, as well as the importance of the fur trade in Canada’s early history. 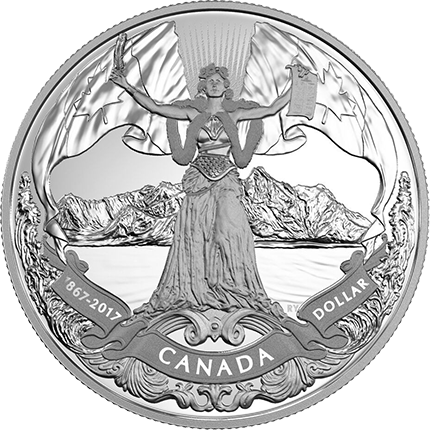 This contemporary take on a classic female allegory, designed by Canadian artist Rebecca Yanovskaya, graces the reverse of the coin. Thirteen rays of light, one for each province and territory, symbolically shines down upon Canada, while the waves at her feet represent the oceans that border Canada on the West and East coasts. The Canadian banners link air, land, and sea, while in the background, Mount Logan, Canada’s tallest peak, represents the diversity of the land and alludes to the ability of Canadians to “rise” to the challenges faced in the past, present, and future. 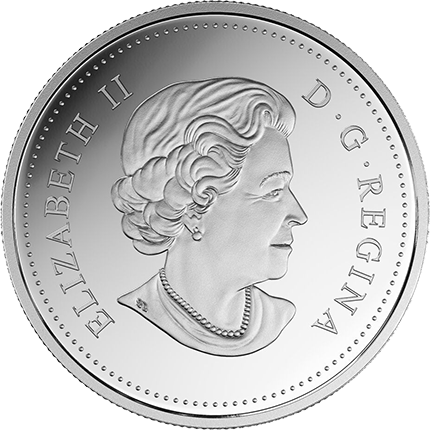 The obverse features Susanna Blunt’s effigy of HM Queen Elizabeth II, which has been included on all Canadian circulation coins and many commemorative and collector coins since 2003. One option for this coin features selective gold plating, which is applied to the rim and the effigy of the Queen and, on the reverse, to the rim and allegorical figure.